Women's active role in the protests was cred with minimizing violence, and marked a sharp contrast with the 1988 protests predominantly led by salafists. An old mother of five unemployed children told the BBC: "There's nothing for the young generation," she said. "No jobs and no houses. They can't get married. We want this whole system to go." Until 1 March 2019, public television, radio, and press totally ignored the demonstrations, while private television channels linked to power dealt with them in a limited way. A boycott campaign was launched against the media. The or-in-chief of Channel III [ar; fr], Meriem Abdou, resigned on 23 February as a protest against the treatment of the movement on the government-run radio station. Several journalists were arrested. A hundred journalists and the NGO Reporters Without Borders publicly denounced the censorship practiced by the Algerian executive. When state TV channels did begin mentioning the protests, they were critical of the protesters and did not refer to their motives. In contrast, the private print media and news sites reported widely on events from the beginning. 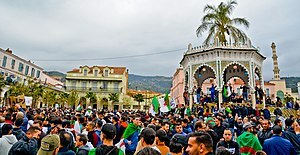 "The protests did emerge in part in response to elements of Algerian social life," wrote Amir Mohamed Aziz, "but they need to be situated in a broader context of African, Merranean and transnational political-economic dynamics."